It’s that time of the year again and we are gearing up for the SAACI 2018 Congress! 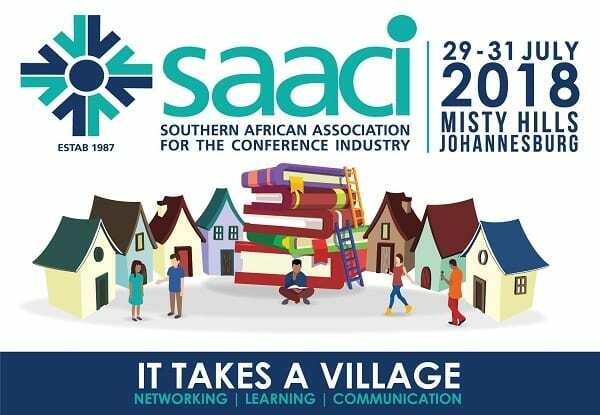 SAACI 2018 will be held at Misty Hills in Johannesburg, South Africa, from 29 -31 July 2018. Rudi van der Vyver, chief executive of SAACI said, “We are extremely excited to open registrations for this industry leading event and this year it will be directly aligned with our new focus areas of learning, growth and collaboration. As per the theme “It takes a village” this event will provide an abundance of networking opportunities, a solid learning platform and encouraging open and honest industry discussions to affect growth for our current and future members alike”. This forward-thinking congress welcomes professionals from a variety of conference industry sectors including conference and event organisers, event management companies and service providers, as well as industry stakeholders representing government, venues and destinations. Registration for SAACI 2018 is open. Visit saaci.eventsair.com/saaci-2018-congress/saaci2018/Site/Register to register. There is a special Meetings Africa registration rate which will be available at the show, which runs at the Sandton Convention Centre from the 26-28 February. Meetings Africa Special rate of R3750 is valid only for the two days of Meetings Africa, 27-28 February, and payment must be made within seven days. We at SAACI have listened to our members and reduced the Congress Registration fees by 20% from 2017. Registration closes on 20 July. The 2018 congress, themed ‘It takes a village’ at Misty Hills in Muldersdrift, Johannesburg from 29-31 July (Sunday to Tuesday). The SAACI 2018 Congress Programme Committee is hard at work developing a relevant programme that will meet the needs of all delegates as well as offer extensive engagement opportunities, from interactive sessions to networking events. We’ll be updating the website saaci.eventsair.com/saaci-2018-congress/saaci2018/Site/Register soon with information about our speakers and descriptions of their sessions. The Minister of Tourism has been invited to do the welcoming address. Several exciting sponsorship opportunities are available, and a warm invitation is extended to companies keen to be involved in the SAACI 2018 Congress, contact Lorin Bowen on lorin@lorinbowen.co.za for more information. Should you have any questions about the Congress, contact Ripcord Promotions on saaci2018@ripcord.za.com. We are looking forward to welcoming you to SAACI 2018 Congress.